I love trying new spirits and discovering bottles that I can recommend to friends, but that rarely happens with vodka. Sure, there are subtle differences between premium vodkas and the volume brands that you can appreciate when drinking vodka straight, but it rarely makes a lasting impression. That was not the case then I first tried Empire Rockefeller Vodka on the rocks. From the first sip I sensed something different and I wanted more. It starts with a very mild sweet taste which then gives way to a remarkably smooth and subtle finish. It’s really unlike any other vodka I’ve tried. Empire Rockefeller Vodka came to market in 2012 but it builds on a heritage that goes back for generations in France. It is the only vodka in the world that is distilled six times in copper cognac kettles in the Cognac region of France which contributes to its unique qualities. The winter wheat used is grown organically in France and the water used in its production comes from pristine French springs, filtered through Champagne limestone. Taste it and you’ll experience why these details matter. The vodka is produced and marketed by the Vintage Rockefeller Wine & Spirits Group which is committed to continuing the tradition of their French forefathers by bringing to market the finest champagnes, wines and spirits handcrafted in and imported from France. The company also produces F. Rockefeller and Sons Champagne, a vintage 2004 champagne, and Signature Rockefeller Cognac, consisting of three lines of fine French Cognac: VS, VSOP and XO. New vodkas are springing up all the time with catchy and unique marketing plans. 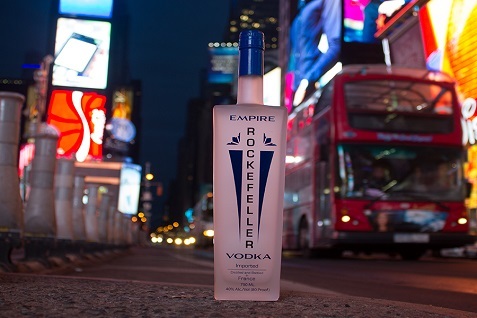 In that sense, Empire Rockefeller Vodka fits right in with an elegant logo and bottle that will look great on any bar. But this premium vodka lives up to its name and offers real quality that stands out. I rarely order vodka on the rocks when I’m out, but if Empire Rockefeller Vodka is on the shelf it now becomes one of my new, favorite options.